We stock “talking” and “easy see” products and offer advice on specialist apps, computer programmes and mobile phones. 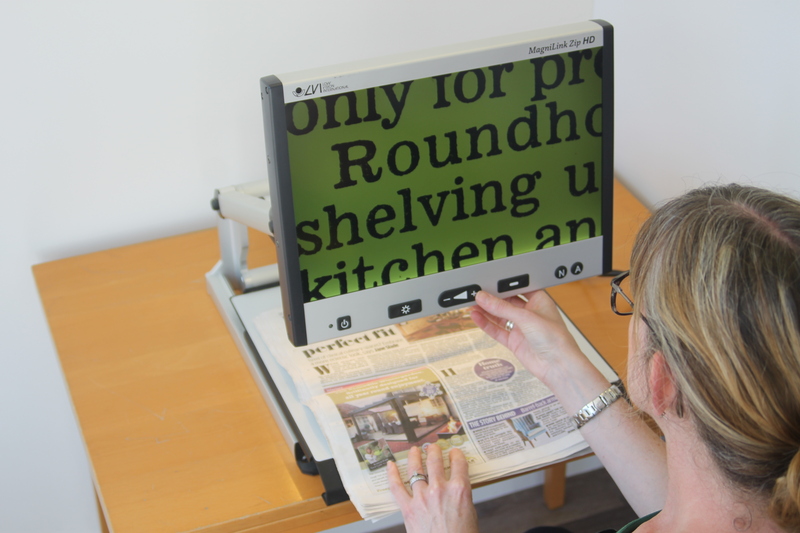 Visit the Centre to find out about all our services and other local and national services which may be of use to you, such as talking books and newspapers. We run technology advice sessions every Monday and Tuesday afternoon. If you would like help setting up your smartphone or tablet or advice on what technology is best for you, please call our Centre to book an appointment on 01702 342131. It is advisable to call ahead to talk to our team and book an appointment so that we can ensure we have the right person available to help. We provide a free equipment loan scheme to all registered blind or partially sighted people living in the Southend, Rayleigh, Rochford and Castle Point area. The loan scheme enables you to try the larger pieces of equipment at home before buying your own so you can be sure you purchase the most appropriate items for you. However the equipment is all donated from our members who no longer require it, so we are unable to guarantee what is available at any time. The service is free of charge but in order to be considered for the scheme, we ask that you visit the Centre and try the various equipment available first. We do also have some second hand items for sale in our Centre such as magnifiers and large button phones. 60 minutes of local news sent to your home every week and it’s FREE. There are 3 different talking newspapers which cover 3 different areas including; Southend, Wickford and Rayleigh, Rochford and Castle Point. The Talking Newspapers provide a service of local news, information and articles from the Evening Echo and other papers, read by our teams of volunteers and copied to USB memory sticks. These are sent, entirely free of charge, to anyone in these districts who is blind, partially sighted, or simply has difficulty in reading. The memory sticks arrive by post, in padded wallets, every week in Southend, every fortnight in the other areas, with FREEPOST return labels. Our centre is situated on the corner of Hamlet Court Road and Ditton Court Road. It is easily accessible, with flat floor entrances. If you have a newly diagnosed eye condition, pre-existing condition or gradually deteriorating eyesight, we can supply you with tools and equipment to help you maintain your independence and make life a little easier. We are open Monday to Friday 10.00am to 3pm. We offer a drop-in service, but you are advised to book an appointment to ensure a relevant advisor is available to see you.